← Google Game: Are there…? According to a report by [the UK]’s Entertainment Retailers’ Association (ERA), while music sales dropped by 0.8 percent in 2009 (the lowest decrease in five years) and all other video fell by by 10.6 percent, VHS sales more than doubled, from 44,377 in 2008 to 95,201 last year. Of course, everything is relative — while PC games, for instance, declined nearly 25% last year, some 6.4 million titles were sold. Truth be told, I probably wouldn’t have bought any of these on DVD because they would have been too expensive to justify the purchase. But I’ve got a working VHS player so that I haven’t had to replace my awesome tape collection, and so that I can continue to grow it on the cheap. So there’s my proof. 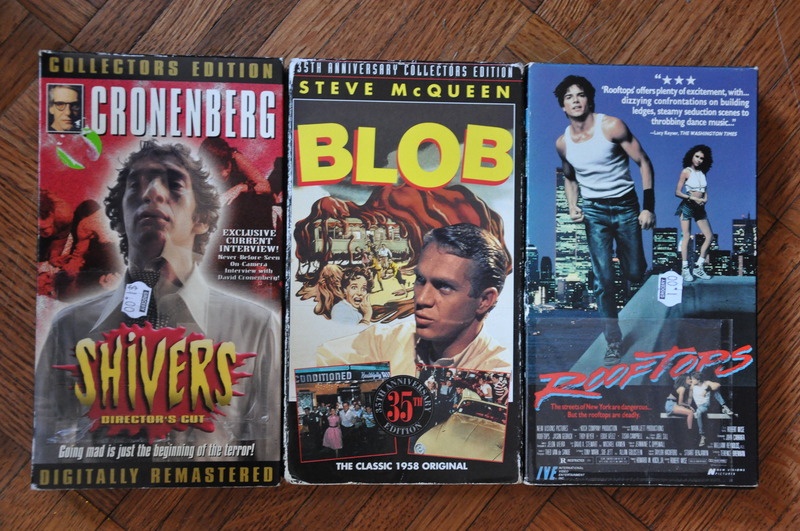 Poor folks like me in the market for pre-21st Century cinema, might just keep the VHS trade going for a while. VHS. QED. This entry was posted in Unhappy Media and tagged cronenberg, media sales, movies, rooftops, vhs. Bookmark the permalink. Wow, times have changed. You know how expensive it is to live on a LES rooftop now? you should come to new jersey and watch a crappy movie [or two] with me.